This project includes the reconstruction of York Avenue from Osborne Street to Memorial Boulevard, reconstruction of Memorial Boulevard from York Avenue to St. Mary Avenue and the rehabilitation of Memorial Boulevard from St. Mary Avenue to Portage Avenue and the rehabilitation of Colony Street from Portage Avenue to Ellice Avenue. Construction notices related to work in the project area will be posted here prior to construction. If you have questions about road renewals or want to receive construction notices via email please contact Mark Vogt at WSP Canada Group Limited, Mark.Vogt@wsp.com and 204-259-5452. This project is anticipated to be approved and funded as part of the City’s Regional Street Renewals program in the 2019 Capital Budget. The anticipated budget for this project is $5,600,00.00. 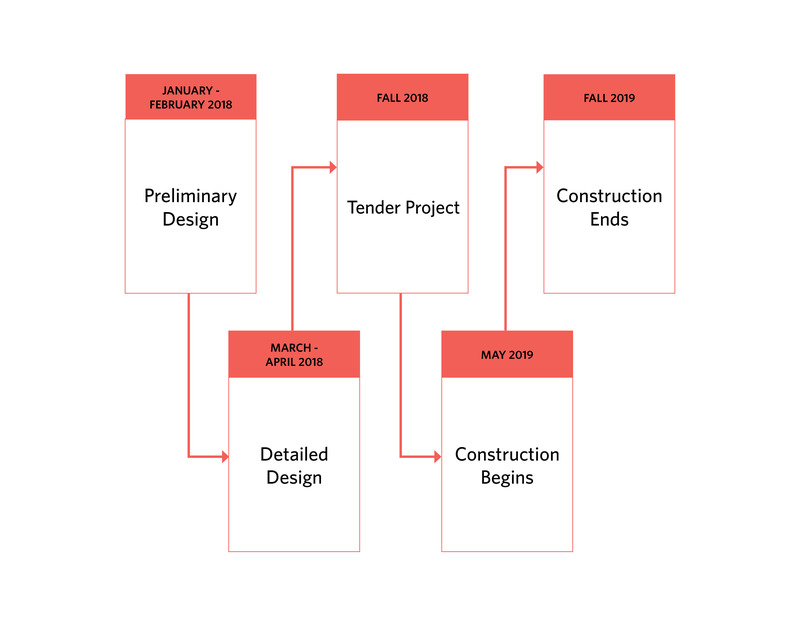 Construction is scheduled for 2019.The Regional Street Renewal Program includes the renewal and reconstruction of the City’s regional streets, sidewalks, and recreational walkways/paths. The purpose of this program is to maintain the level of service, structural integrity and readability of the transportation network. The pavement reconstructions will include the replacement of the concrete pavement, curbs and sidewalks. The pavement rehabilitations will include concrete spot repairs to the road, asphalt resurfacing, curb repairs and sidewalk repairs and renewals. The reconstruction of Memorial Boulevard from York Avenue to St. Mary Avenue will also include new protected bike lane for both southbound and northbound travel and may include plans to extend the bike lanes to Broadway in the future. Due to low traffic volumes on southbound Memorial Boulevard between St Mary and York the two existing travel lanes will be reduced to a singular travel lane to allow existing parking to be maintained. This project will improve travel in the area for all modes of transportation. Motor vehicles will benefit from a resurfaced roadway that will address drainage issues as well as rutting and potholes. 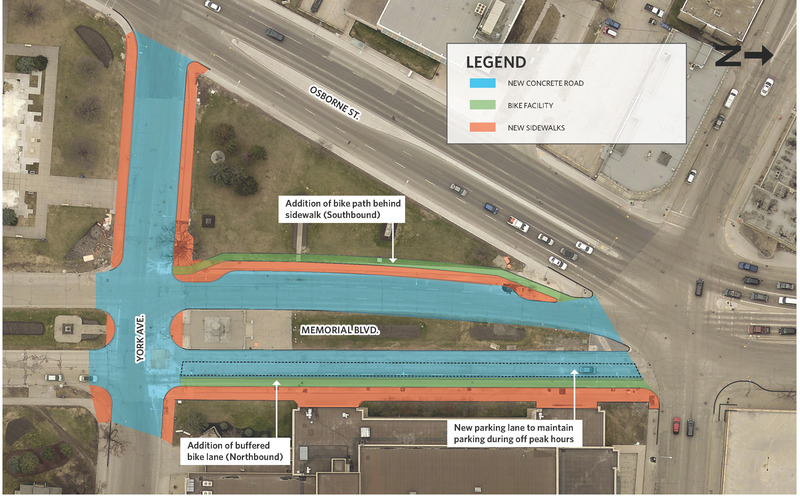 Protected cycling infrastructure will be added along Memorial Boulevard with possible future expansion to Broadway. Sidewalks will be upgraded for pedestrians within the project limits to be in conformance with the City’s accessibility standards. The anticipated budget for this project is $5,600,00.00. The project is currently scheduled for construction in May 2019 and will be completed in Fall 2019. What road work is planned? How can I access my parking spot along Memorial Boulevard/Colony Street during construction? Work will be staged to keep the roadway open to traffic throughout construction. During work on approaches and gutter lanes, short term closures of approaches will be done to accommodate placement of asphalt pavement. Work will be split into stages to maintain traffic flow as much as possible throughout the project. Resurfacing work in the St. Mary Avenue and Ellice Avenue intersections will not occur during the day on weekdays. Separating cyclist, pedestrians, and vehicles is the safest way to accommodate each mode of transportation. The City is committed to expanding and upgrading pedestrian and cycling infrastructure to build a safe and accessible network for people of all ages and abilities.